Artikel dibawah ini hanya kopi paste, bukan niat untuk plagiat tetapi untuk menyimpan saja agar sy lebih mudah mencarinya di kemudian hadi jika sy memelukannya lagi. 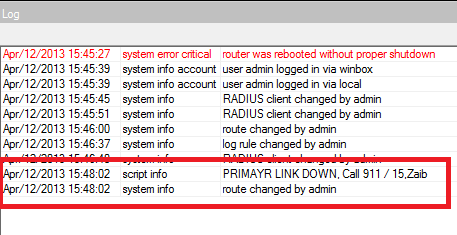 https://web.archive.org/web/20151014092819/https://aacable.wordpress.com/2013/04/12/mikrotik-multiple-wan-fail-over-scripts/saya ucapkan benar-benar terimakasih karena telah sangat-sangat membantu sy dalam melakukan routing gateway mikrotik. In this short reference post , I will post some WAN link fail over scenarios. For example If you have two DSL wan links, and one of link goes down , What will happen? If your DSL modem is down – then check-gateway=ping can save your packets from being sent to that link , But what if your modem is up, and telephone line is down? Or one of your ISP has a problem from there end ???? There are several method that you can use to sort this problem, either by using NetWatch tool to monitor WAN link , or you can use use scripts to periodically ping remote hosts. And then disable/enable routes. Following is a very simple method you can use for fail over. We have two WAN links and we want to use second WAN for fail over ONLY, No load balancing is required. 3# You can use different host ip addresses for monitoring, preferably your primary ISP’s reliable servers like DNS or other. You can use other web sites ips too. The above fail over method works fine,when the WAN1 link will fail , it will automatically fail over to secondary link, and when the wan1 link becomes available all load will shift back to wan1 link. The only negative is that we are using single wan host to monitor, if that particular host (e.g 8.8.8.8) ping goes down and the rest is fine , wan1 link will still shift to secondary link. To avoid it use multiple hosts to monitor wan connectivity. If you have 2 WAN Links , and you want to use Primary Link for Main internet usage, and in case Primary Link [WAN1] Looses its connectivity with the INTERNET (For example problem with the link between your modem and ISP or Problem between ISP link and the internet), then Secondary Link take its place, and when Primary link [WAN1] restores, it will become active again. You can use the following scripts. You have to create two scripts for this purpose. SCRIPT-2 > UP will will change Default Primary Route distance value to 1. Now ADD Scripts that will be executed in UP/DOWN event. You will see following entries in LOG when WAN link goes DOWN and UP. You can also configure actions to email or SMS you if any link goes down for tack purposes, or if you want to be informed about the WAN status. Script is good , because you can control the frequency and lot of other functions too. 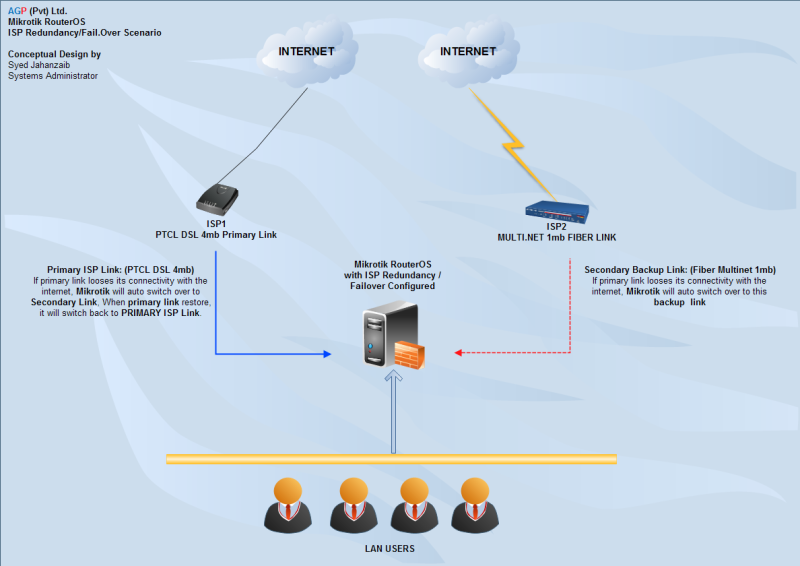 The following script does the two wan load balancing using PCC method, also if any of WAN link will fail , it will automatically fail over to secondary link, and when the particular failed link becomes available load will be start distributing among both links (remember it will not shift back previously made connections like downloads via idm etc. new packets will be distributed) .The only negative is that we are using single wan host to monitor, if that particular host (e.g 8.8.8.8) ping goes down and the rest is fine , wan1 link will still shift to secondary link. To avoid it use multiple hosts to monitor wan connectivity.